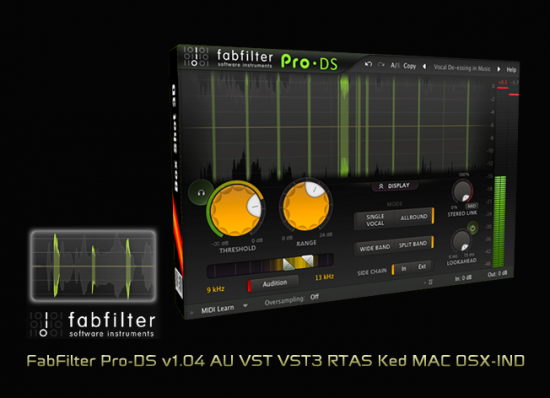 FabFilter Pro-DS is an intelligent de-esser plug-in. 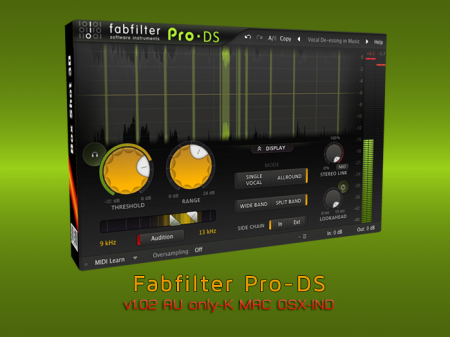 Featuring ingenious vocal sibilance detection, powerful processing options and insightful metering, truly transparent de-essing becomes effortless with FabFilter Pro-DS. The unique newly developed Single Vocal algorithm in Pro-DS has an uncanny ability to separate sibilance from non-sibilance in individual vocal recordings. It almost always works right away without the need for complex manual tuning, making the de-esser very easy to set up. Alternatively, the classic Allround detection implements a custom side-chain filter path, tuned to perfection for de-essing full mixes or high-frequency limiting of any material. 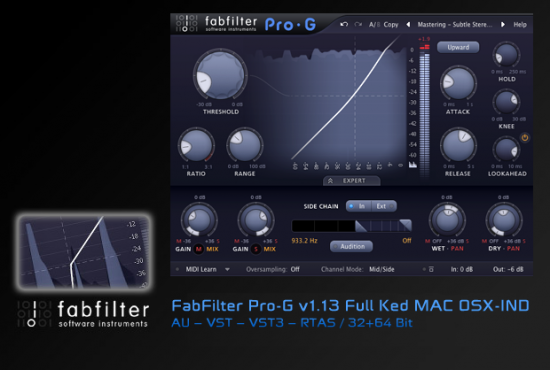 The intuitive interface in FabFilter Pro-DS makes it easy to find the right settings quickly with great visual feedback. A large real-time level display shows a scrolling input waveform and highlights the parts affected by the de-essing algorithm, showing you exactly how much processing is going on. Finding the right Threshold setting becomes a trivial task with the circular side-chain input meter around the Threshold knob. In addition, the side-chain filter slider displays a real-time spectrum analyzer, enabling you to easily zoom in on problem frequencies. Advanced GPU-powered graphics acceleration ensures seamless animation and also keeps the main CPU free to do audio processing. To fine-tune the sound, FabFilter Pro-DS offers optional look-ahead (up to 15 milliseconds) and adjustable stereo linking. In addition to general wide-band processing, linear-phase split-band processing is also available. Together with optional mid/side processing (affecting only the mono or stereo content) and up to four times linear-phase oversampling, Pro-DS is capable of highly transparent de-essing in the most demanding situations. All this power combined with its innovative, easy-to-use interface makes Pro-DS the perfect de-essing solution for any mixing and mastering job. • Highly intelligent 'Single Vocal' detection, and classic 'Allround' detection. • Adjustable Threshold, Range and High-Pass and Low-Pass side-chain filtering settings. • Wide Band or linear-phase Split Band processing. • Optional look-ahead time up to 15 ms.
• Freely adjustable stereo linking. • Optional mid-only or side-only processing. • Up to four times linear-phase oversampling. • Real-time de-essing display, clearly showing the affected parts of processed audio. • Side-chain input meter, making it easy to choose a good Threshold value. • Real-time spectrum analyzer built into the HP/LP filter controller. • High-quality 64-bit internal processing. • Double-click text entry of parameter values. • Large and compact interface sizes (with or without the real-time level display). • Stereo and mono plug-ins available. • Supports common Pro Tools hardware control surfaces, such as Avid ICON D-Control and D-Command. • All the usual FabFilter features you've come to expect: perfectly fine-tuned knobs and controllers, interactive MIDI Learn, undo/redo and A/B switch, Smart Parameter Interpolation for smooth parameter transitions, an extensive help file with interactive help hints, sample accurate automation, advanced optimization, and more.